Lake Retba, in Senegal, is known as the "Pink Lake." 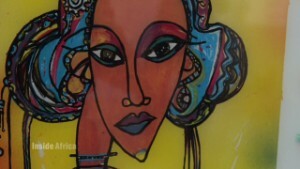 It is becoming one of Senegal's most popular tourist destinations. Piles of salt drying on the shores of Lake Retba. The lake's salt content rivals that of the Dead Sea and the combination of the sun and salt-loving micro-algae has given the water its color. 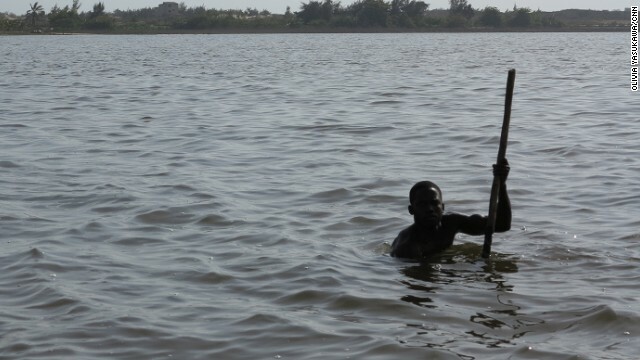 Senegalese men such as 24-year-old Moussa Fame collect salt from the lake to earn a living. Fame uses a wooden boat called a "pirogue" -- anything made of metal would rust immediately. He works chest-high in the lake, for seven hours a day. 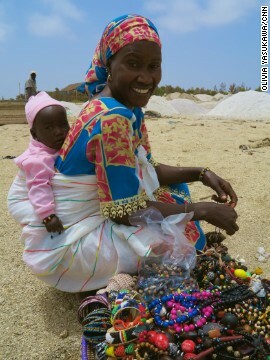 A woman selling jewelry on the shore of Lake Retba. 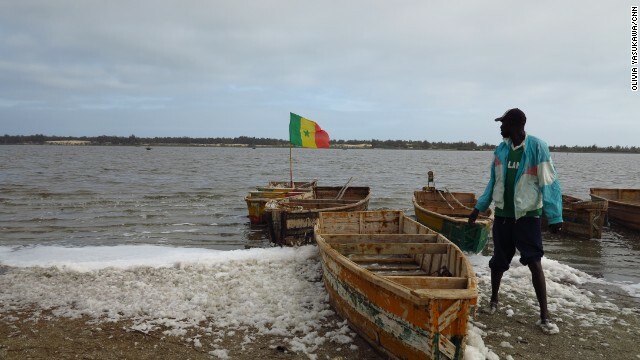 Fame's 21-year-old wife Mariame carries the salt from boat to land. She earns five cents for every bucket she transports; he earns 60 cents for every bucket he harvests. Inside Africa takes its viewers on a journey across Africa, exploring the true diversity and depth of different cultures, countries and regions. 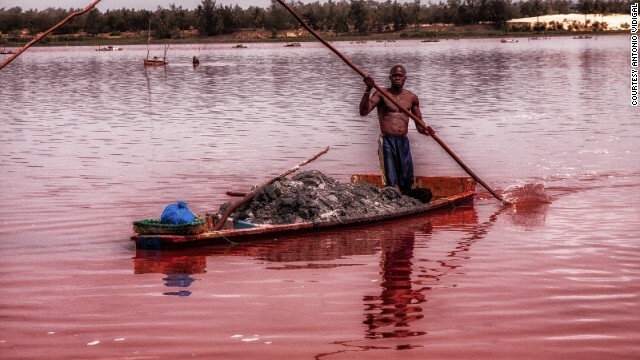 Lake Retba, Senegal (CNN) -- On the edge of Senegal's Cap Vert peninsula, a lush coastal region, lies Lake Retba ... a coral pink lake. Nestled between white sand dunes and the Atlantic Ocean, this unique body of water was once the finishing point of the off-road car race, the Dakar Rally. The three square kilometer fuchsia lake has been a candidate for UNESCO World Heritage status since 2005 and is fast becoming one of Senegal's most popular tourist destinations. While the rally may have shifted to South America five years ago, men and women from West Africa continue to come here for an entirely different reason -- to harvest salt. The longer you stay inside the lake, the larger the salty water makes your wounds. The salt content of Lake Retba or Lac Rose, as it's locally known, rivals that of the Dead Sea -- exceeding 40% salinity in some parts -- and it is a combination of the sun and a salt-loving micro-algae, dunaliella salina, which has turned the water a brilliant shade of strawberry pink. Men once used to fish in the lake but by the 1970s, in response to ongoing droughts and economic hardship, locals began to collect and sell salt to supplement their families' income. 24-year-old Moussa Fame came from Mali to work in the lake seven years ago. 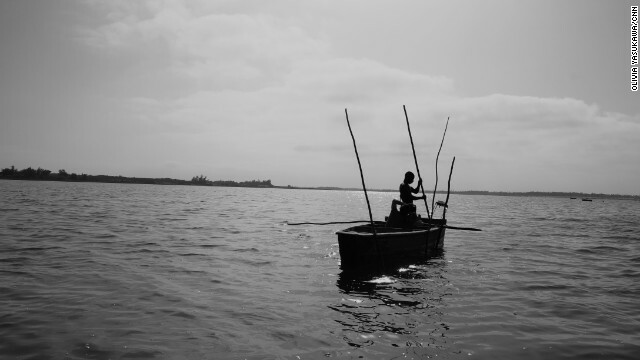 He works alone, chest-high in the lake, for seven hours a day with the most basic of tools -- a basket, spade and stick. To protect his skin from the harsh salinity, Fame rubs shea butter on his body before entering the water. "As a harvester, if you don't put shea butter on your skin, the salt will damage it and cut you," he said. "The longer you stay inside the lake, the larger the salty water makes your wounds. If you do not cover those wounds with shea butter, they will become worse." With a depth of only three meters, Fame paddles to his chosen area using a long stick to push against the bottom of the lake. The boat he rents is called a pirogue and is made of wood -- any engine or metal fixture would immediately start to rust. "I know where to collect the salt from. When the stick I am using touches the salt, I can feel it," Fame said. "If I find a place, I attach my boat and use the shovel to see if there is enough salt in that place. After that, I put the sticks in place and start piling the salt around those sticks." 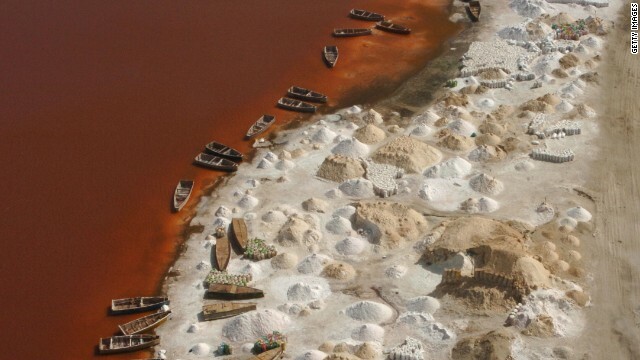 It is estimated 1,000 people work around this lake -- 600 men and 400 women who collect 24,000 tons of salt each year. "The people working here as harvesters are Malians, some are Guineans, some Ivorians, Burkinabe and even some from Guinea-Bissau. 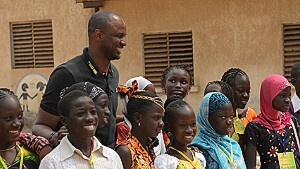 There are also some Senegalese," Moussa said. It is mainly men who work as harvesters, filling their baskets with salt before heaving it over their heads into their boats. "Sometimes I harvest 10 to 12 buckets," Fame said. By the time Fame paddles back, his 21-year-old wife, Mariame, is onshore, awaiting his return to carry the salt from boat to land. Fame makes 60 cents for each bucket of salt he collects. His wife earns five cents for every bucket she transports. In the midday heat, men and women move between piles of salt -- transporting, drying and trading the mineral. 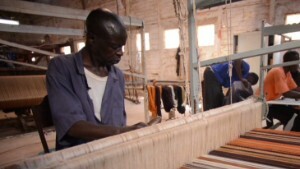 Over 70% of it is exported around West Africa, particularly to the Ivory Coast. "Here, we have two different types of salt," said Demba Dieng, a wholesaler who buys and re-sells salt. "The first is called 'medium salt.' This type of salt is bought by people drying fish or working in the leather industry. 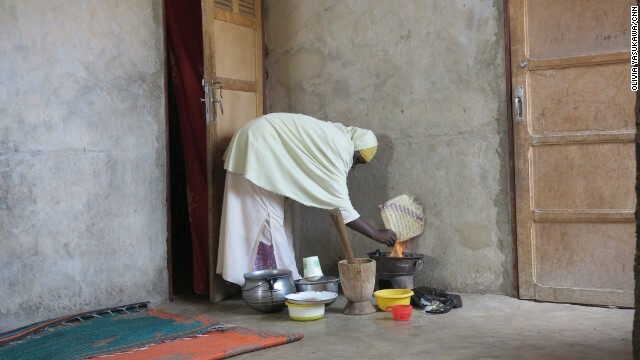 "The 'big salt' is the second type which we use in Senegal in our food," he said. "However, in Europe, they use the 'big salt' to melt ice on the roads." While most of Fame's salt will be sold on, he has kept some for his family back in Mali in the hopes that one day, he can share it with his father, who also used to be a salt harvester on Lake Retba. "It will be a gift to my mother that she will cook with," he said.